Dog is perfect for youth who are interested in learning more about dogs, how to care for a dog, and how to train a dog in basic or advanced commands. The dog project is unique and not meant to conform to AKC dog show or other professional standards. Although beginners do not need to own a dog to participate in the first level of the project, the more advanced levels do require dog ownership. Each level may take up to three years to complete. 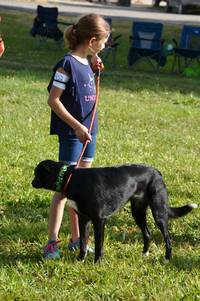 Youth members (not Cloverbuds) can sign up for one of the four levels of Dog Obedience: Sub-novice, Novice, Open, and Utility. Dog/Agility training begins when the 4-H member has been in the dog project for at least one year.